The Weather in the Bahamas is ideal for those on holiday. The islands are situated at the top of the Caribbean, just east of Florida and are made up of over 700 islands, each of which have a similar climate. The climate in the Bahamas is moderated by the Gulf Stream and the weather is slightly cooler than other Caribbean islands due to their northerly location. Average temperatures in the summer range from 27 to 32 degrees Celsius (80 to 90 degrees Fahrenheit). In the winter holiday makers can expect temperatures of 21 to 27 degrees Celsius (70 to 90 degrees Farhrenheit). The constant breezes cool the temperature during the day and night. The islands experience some humidity however, which can make the temperature feel higher than it is. The rainy season in the Bahamas runs from May to October, and October and June are the wettest two months. Despite many rainy days, the Bahamas have around 310 days of sunshine each year. Hurricanes are not a major risk in the Bahamas but the generally miss them, heading to the west towards the United States. 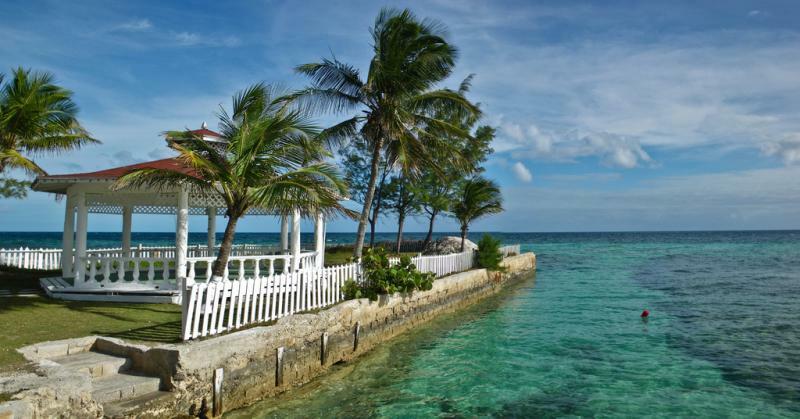 The Bahamas is a year-round destination, and is most popular in the winter months (October to April) when holiday makers escape the winter weather at home. The summer is off-season in the Bahamas and it is possible to get better holiday deals. Those going on holiday to the Bahamas in the summer season also have the benefit of fewer crowds and empty beaches. Most guests spend the majority of the holiday in shorts, T-shirts and tank tops, swimwear and sandals; and bring plenty of sunscreen, a hat, sunglasses and a light covering like a sarong. Wear lightweight and light coloured clothing for protection from the hot sun and, in addition, long trousers (preferably zip offs) and a light raincoat are useful on rainy days. It's also a good idea to take a warm jersey or two for cool or windy nights, as well as a windbreaker. Bring comfortable amphibian footwear for adventures and treks, as well as a day backpack, with zip locked bags to keep valuables dry. While most people are very casual, islanders themselves prefer smart casual dress and some restaurants, as well as churches (don’t forget to cover up properly), require upscale attire. Note: January is a popular month to visit the Bahamas and hotels need to book hotels in advance. Events: There is a Mardi-Gras type of festival which takes place over New Year in Nassau and Freeport and other islands. The New Year's Day sailing regatta takes place around Nassau and Paradise islands. Note: February is a popular month to visit the Bahamas and hotels need to book hotels in advance. Events: Anglers converge on Bimini island for the mid-winter Wahoo. Note: It is spring-break season in the Bahamas from the beginning of March and into mid-April and holiday makers can expect to see lots of college and high school students. Before booking your hotel rooms, it is worth checking with your hotel to see if there are any big groups booked in. Note that the US college spring-break runs into mid-April. Events: Regatta Time in Abaco (early July); Independence Day (July 10); Cat Island Regatta (late July or early August). Events: Emancipation Day is on the first Monday in August and commemorates the emancipation of slaves in 1834. Events: The All Abaco Regatta takes place at Treasure Cay Harbour in late September. Events: On 12 October the Bahamas celebrates Discovery Day, the day when Christopher Columbus is said to have first landed on the island of San Salvador. Events: Guy Fawkes Day is celebrated on 5 November with the best celebrations in Nassau. Events: Junkanoo Boxing Day, parades and celebrations on all the islands (26 Dec). There are similar celebrations on New Year's Eve. Note that the islands are at their busiest over Christmas and New Year and hotels will need to be booked well in advance.